McKinley students learn class routines on the first day of school. Kudos go out to Lincoln educators Bethany Barry and Robin Pedzinski for actively supporting their students during weekly Social Emotional Learning lessons. Lincoln Principal Tammy DeWolfe reported she observed both actively engaged in a lesson being taught by Lincolns School Health Professional making supplies available and supporting follow-up discussion by student participants. Achieving our first core belief in meeting the social-emotional needs of all students will be a lot easier if we work together, and the Lincoln staff's team approach is a great example of this! The McKinley Elementary staff continues to exemplify our core belief that learning growth matters most, and doing so requires risk-taking by students and staff. A recent visit by our Literacy Consultant Brenda Nardo indicated there’s an extremely high level of commitment to literacy improvement at McKinley, and the staff is doing quite purposeful work. I especially appreciated hearing reports of the staff being willing to take risks by trying new strategies. There is no better way to support student positive risk-taking that for staff to set the example. Keep up the great work Wildcats! Perhaps the most important work we're doing as a district is taking place through our Interest Based Strategies activity focused on attracting and retaining high-quality staff to work with our students. One strategy that is emerging is the belief that we need to support and encourage more of our students to consider careers in education. Recently we learned the University of Colorado at Boulder School of Education is offering guaranteed admission for all high school graduates who complete a Teacher Cadet of Colorado program. Students who meet baseline academic criteria, who then apply to the CU Boulder School of Education, will be guaranteed a spot in the program. CU Boulder is doing this to remove barriers for students who indicate an interest in teaching and leadership professions, particularly those who come from marginalized backgrounds. This is great news for students who participate in the Cañon City High School Teacher Cadet program! Speaking of our future focus, last week we received notification from the Colorado Association of School Boards that our Board of Education’s convention session proposal titled “how one rural Colorado Board of Education is intentionally planning for long-term success” was awarded a presentation slot. Thus, at this year’s conference Larry Oddo, Lloyd Harwood, Mary Kay Evans, Shad Johnson, and Robin Reeser, along with Assistant Superintendent of Schools Adam Hartman, will teach other school district directors how we believe transparent, steady, consistent, and effective governance can make a big difference in the long-term success of a school community. Instructional Technology Coordinator Dan Coppa helps CCHS students log in to their new Chromebooks. Assistant Superintendent of Schools Adam Hartman reports Mr. Coppa's work is helping the implementation go smooth and productive. 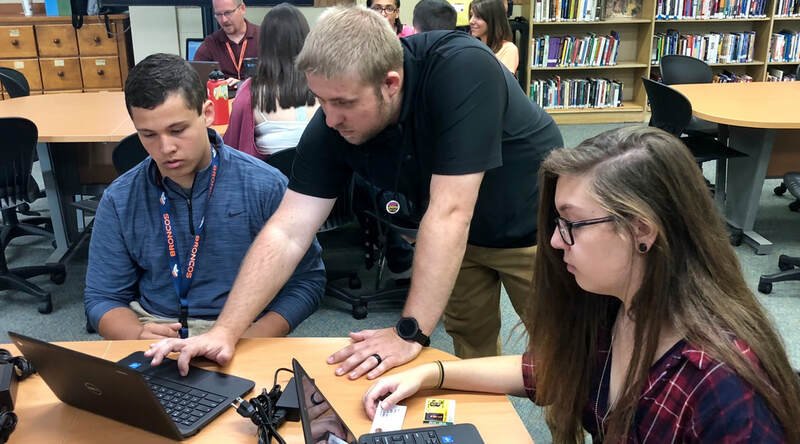 Dan reports teachers at CCHS are already feeling quite comfortable and confident moving toward offering blended learning opportunities for their students. Additionally, McKinley teachers are starting to gain have a feel for how and when the use of devices is appropriate. In fact, Dan will even be supporting a kindergarten lesson next week using devices. Mr. Hartman says, “I’m incredibly proud of Dan, and 100% confident the middle school roll out next year will go even more smoothly.” Adam says the reason for this is we’re able to begin professional development with middle school staff earlier than we were at the high school last spring. These teachers will have the remainder of this school year to learn about blended learning opportunities and purposeful use of the devices well in advance of their students receiving the computers next fall. We believe middle school teachers will depart for their summer break already having the opportunity to build out a fair bit of curriculum and lesson planning for the 2019-20 school year. This will allow them to hit the ground running in the fall, further reducing any anxiety. Architect Doug Abernathy discusses floor plan specifics with the CCMS design committee. Washington design team members discuss where the best location for a two story structure would be. Last Tuesday our Cañon City Middle School design team met once again to work on the building footprint. For the most part, we have settled on a concept, with new structures to be added to the west side of the current structure. This means we’ll soon be able to make final decisions where major spaces can be located. This includes the possibility of a new bus lane along 12th Street and expanding the current gym to two floor capacity with a divider curtain. Our next steps include actual building mapping and working on key characteristics of each space. Last Wednesday the Washington design team agreed on a general design concept as well, short of where a two-story structure will be located on the property, be it at the north or south end of the campus. This decision will be made after architects work in more detail on both options and create 3D elevation designs to share back with the design committee. We’ve also made plans to revisit some of the more creative school floor plans we visited this summer so Washington staff can see how they are utilized when kids are in the building. This will help tremendously with final design decisions. Last Monday I focused on long-term projects on Monday. On Tuesday I participated in another round of PCC-Fremont Campus Dean interviews. I attended CCMS and Washington design meetings on Tuesday and Wednesday afternoons. I attended a series of meetings on Wednesday and Thursday, including our second IBS session on Attracting and Retaining High-Quality Staff and a. Wonderful regional health and wellness collaborative information meeting. On Friday Assistant Superintendent of Schools Adam Hartman and I attended a Cañon City Community Agency Grant interview on behalf of CCEOE. Colorado's Gallagher Amendment requires a 45% to 55% residential to non-residential property tax split, on occasion driving residential property tax assessments downward. Last week, as part of a directive by our Board of Education to distribute factual information about Amendment 73 I explained what it is designed to do for education in Colorado. This week I'd like to explain why it landed on the ballot. Folks following Colorado Public School Finance over the past three decades are familiar with the chart pictured. 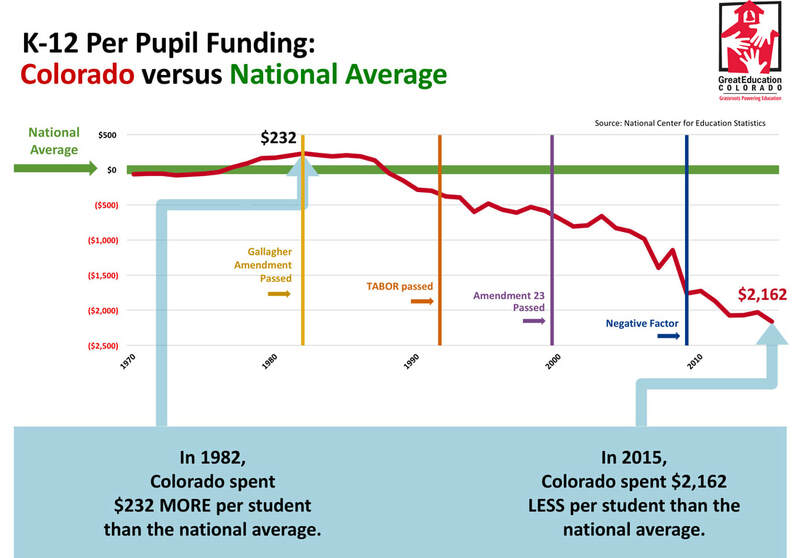 It illustrates how far Colorado per-pupil funding has fallen below the national average since the mid-1980s. The most up to date data indicate Colorado invests $2,162 less per student than the average state. With more than 800,000 children in our public schools, this means Colorado is now roughly $1.8 billion in total annual funding below the national average. The best question to ask when viewing this chart might be, "why is this the case?" "Can't our legislature simply pass a law to fix this?" The answer is the ability for the Colorado legislature to secure additional revenue from its citizens to invest in education is severely restricted by two voter-approved constitutional provisions, the Taxpayer Bill of Rights (TABOR) and the Gallagher Amendment. As is the case for all states, times of economic hardship can severely limit the amount of revenue a state's treasury collects because business and personal income reduce dramatically. Unique to Colorado, the interplay between the TABOR and Gallagher Amendments additionally reduces the amount of revenue Colorado governments (state and local) can collect even in times of economic prosperity. Some view this as a positive. Others, not so much. Alternately, this interplay between TABOR and Gallagher has also driven the taxable rate of residential property down to where Coloradans are assessed among the lowest property tax in the nation. While the Gallagher Amendment drives property assessment rates downward on occasion, TABOR ensures they cannot go back to where they were without voter approval. A related question Fremont County residents might ask themselves is, "why, through ballot question 6B, is the Cañon City Area Fire Protection District once again seeking to raise our tax mill rate?" "Didn't they just do this four years ago?" The answer is, thanks to how the Gallagher Amendment continually lowers property tax assessment rates, the Cañon City Area Fire Protection District must go back to its voters every few years asking to raise its mill levy once again simply to collect the number of dollars they were approved to receive after their most recent successful election. Some feel this is no way to fund a local government entity as important as a fire district. Some are quite OK with this. Meanwhile, Colorado has one of the fastest growing economies in the nation. Yet, the Colorado legislature has no power to solve the underfunding of our public school system without a vote of the citizenry. Ironically, in the early 2000's an additional change to Colorado's Constitution was approved by voters; Amendment 23. This was designed to override provisions of TABOR and Gallagher in an effort to bring Colorado education funding back near the national average over a period of 10 years. Unfortunately, when the Great Recession hit in 2008 the Colorado legislature stripped out the modest funding gains being made by Amendment 23 by imposing something called the Negative Factor on the school finance formula. The result has been more than a $7 billion shortfall in education funding for all school districts in Colorado combined in comparison to the measure's promise. Cañon City Schools' share of this Negative Factor shortfall totals more than $33 million to date, roughly $3.2 million per year. The result has been six years of frozen salaries (making it difficult to attract and retain high-quality staff), a reduction in the total number of employees leading to increased class populations and workloads, elimination of key programs such as social-emotional counseling, imposition of steep participation fees in daytime and afterschool programs, an inability to afford routine updates to learning resources and technology, and difficult choices made to defer building maintenance while keeping the district budget afloat. Though Cañon City voters approved an operations override in November 2017, the additional $1.385 million per year provided by local citizens actually falls more than $2.3 million per year short of where the district would be had Amendment 23 remained fully funded. So why ask voters to approve one more change to Colorado's constitution? The underfunding of Colorado's public school system is rooted in the constitutional conflicts created by TABOR and Gallagher. As a result, the only way it can be addressed in a way that would stop Colorado's per-pupil funding trend line from falling yet further away from the national average is by repairing this conflict, allowing citizens to direct new revenue into the public education system. This can only be done by a vote of the people, as is the requirement of the TABOR Amendment. But wait a minute here, doesn't Colorado have one of the fastest growing economies in the nation, and didn't K-12 public education just get a large infusion of funds from the legislature this past year? The answers here are yes, and yes. However, the only reason Colorado's legislature had the ability to collect and expend significantly more revenue in 2018 was that a 2017 legislative compromise taking Hospital Provider Fees out of the TABOR factor was enacted. If this had not occurred, instead of funding transportation and public schools at a slightly greater level this year, the State of Colorado would have been sending tax dollars it had already collected back to its voters. Current Colorado revenue forecasts indicate our economy is still operating strong and revenues are expected to increase once again. However, without the passage of Amendment 73, TABOR will require much of that additional revenue to be mailed back to taxpayers in the form of refund checks ranging from $15 to $50 each. Because of this, groups of concerned citizens from around Colorado worked for the past two years to create the language seen in Amendment 73, collected the required signatures in each Colorado Senate District, placing it on the ballot. In conclusion, Colorado's chronic underfunding of its public school system is a constitutional issue. Thus, it takes a constitutional change to fix it, and this is why Amendment 73 is on the ballot.